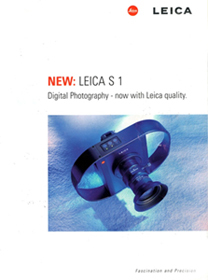 Way back in the Stone Age of digital imaging (circa 1996), when 2 to 3MP digicams that took so-so pictures cost over a thousand dollars and pro-quality DSLRs were still a stretch - both technically and financially for most shooters, Leica unveiled an amazing digital camera called the S1. Now keep in mind this was a time when film was still the media of choice, the Leica M6 was still the best film camera money could buy, and stock houses were still trying to figure out how to manage pictures that only existed electronically. The S1 was in fact a digital scanning back designed to capture square (36x36mm) images using 35mm lenses. Though designed with Leica R-series lenses in mind, Leica also offered lens mounts for Nikon, Contax, Canon FD, and Minolta lenses as well as for medium-format optics from Hasselblad and Pentax (6x7). There was also a Novoflex adapter that allowed you to use large-format optics from Rodenstock & Schneider, and a tilt-shift adapter for use with Hasselblad lenses. The S1 could also be coupled to the rear of a view camera to take advantage of tilt, swing, and shift movements. As for focusing the S1, you used the camera's angled, laterally correct, gridded focusing screen. Because it was a triple linear CCD scan back the S1 recorded images line-by-line and exposures ran about 185-seconds each. As such, the S1 was optimized for use with continuous light sources including HMIs, fluorescents, and halogen lamps. Though slow, the S1 yielded 76Mb @ 24-bit (151Mb @ 48-bit), 5140 x 5140, 12-bit RGB image files that contained little if any of the artifacting, blooming, and fringing that continue to plague us to this very day. The native ISO for the S1 was an honest ISO 50, the D-max about 3.3, and the image files contained a dynamic range that spanned 11-stops of latitude. At 300 dpi you could produce incredibly sharp 17 x 17" prints without having to interpolate the image, which in 1996 was a really big deal. 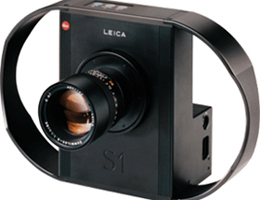 Included with the Leica S1 was a 55mm IRa filter, LaserSoft High Software, a PCI card (PC or Mac), and a 20' cable. As for system requirements, the S1 ran off of PowerMacs (7.55 or higher), or Pentium PCs (Windows 95 or higher) with a minimum of 256MB of RAM, a hard drive of at least 1GB, and Photoshop 3.05 or higher.